If you enjoy leafy greens or salad greens you will enjoy this unique salad green that was discovered by accident in Belgium in the 1800’s. It grows in the dark with the use of chicory. Another reference for this lettuce is chicory heads. The vegetable we are referencing is “Endive“. Enjoy the video and we hope you enjoy preparing Endive and Fruit Salad with Chicken. Lowers glucose levels in the blood stream and helps control insulin resistance. Reduces LDL cholesterol levels (bad). Improves skin health and helps improve eyesight and protects the body from certain types of cancers. The vitamin B complex content in endives such as folic acid, thiamin, niacin, and pantothenic acid encourages the metabolism of carbohydrates and fats. Helps with digestion by increasing and stimulating the appetite because of the bitter juices from the leaves that improve the secretion of bile. Natural diuretic as it consists of 95% water. Eating endives regularly can help clear skin of acne problems. Making a juice of endive leaves, celery and carrot can help to treat respiratory problems like asthma. Parsley and celery juice with endives added to it can be used to treat anemia. You could treat constipation by mixing endive juice with either apple juice or carrot juice. Blend endive juice with carrot and celery or parsley and spinach juices for an effective treatment for eye problems such as glaucoma or cataract. Preparation is for 2 servings. Heat a large skillet with oil and cook chicken until no more pink. Add pecans and sauté brieﬂy. Slice endive in ½ inch thick strips, remove peel and cube grapefruit and orange, grate apple and cut leek stalk in rings. Mix all ingredients together in a large salad bowl. In a small bowl mix yogurt, cream, orange juice, vinegar, salt and pepper and pour over salad and toss. 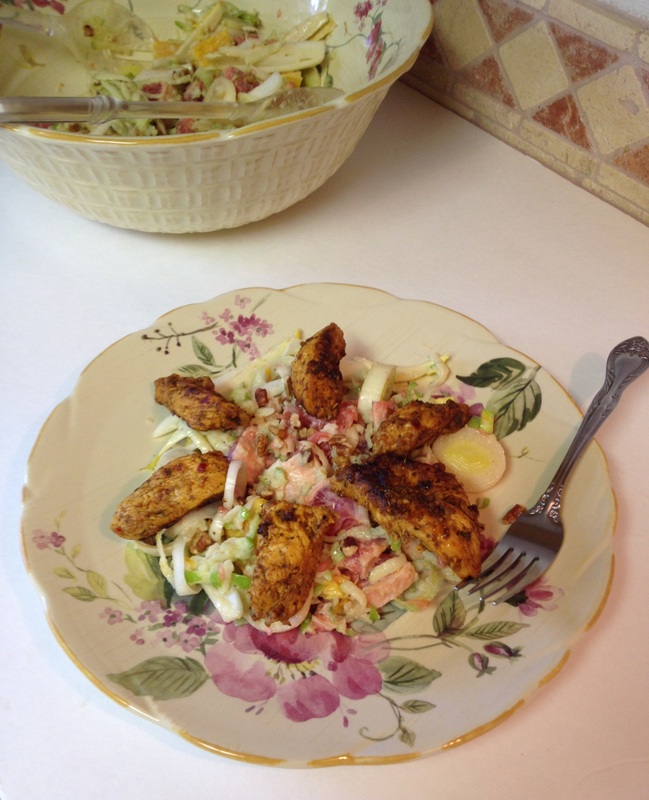 Plate salad and top with chicken strips. Can Granny Smith Apples Really Help You Lose Weight? Worst, Better, Best Hot Apple Ciders! This entry was posted in Salads as a Main Course, Videos and tagged Açaí palm, Apple juice, Barbecue chicken, Bodybuilding supplement, carrot juice, Casserole, Cauliflower, Cinnamon, Clove, Coupon, Cranberry juice, Endive, Fruit Salad. Bookmark the permalink. Hey thanks Roger. I am glad to post recipes you and Aaron are welling to try! As always thanks for your kind words and thoughts. For stopping by as well. Thanks Jovina. Endive is really unique, not just taste, but also that it is grown in the dark!! Thanks for cimmenting and stopping by. Sounds great, I had to look up what kind of plant Endives were to see if it was a spice or vegetable. You might find them Honey. They are native to Belgium. Read up good on growing them though, they grow in the dark for 6 months. Most of the endives sold in the States are grown in California. The process is lenghthy and expensive i think, because they are not chip. Conventional grown are about 5.00 for a package of 3 or organic grown are loose for 5.00 a pound. That was the last I seen.